Does PowerDirector 17 support horizontal scroll with the Logitech MX Master 2s? Hi there, I'm thinking about upgrading to PowerDirector 17 because I'm using 14, which is pretty old at this point. But I would like to know if the new version supports the horizontal scroll wheel, PowerDirector 14 doesn't seem to; which is unfortunate because I find it to be very helpful with video editing. Hopefully, someone who does have a similar mouse and PD17 will post if there's any native support built in. My Microsoft 3500 has a scroll wheel. PD12- scrolls up and down. PD14- scrolls up and down. PD17- scrolls left and right. My website http://bgillcyberstudio.com/index.html LINKS TO PDTOOTS & hundreds of other valuable resources! Quote My Microsoft 3500 has a scroll wheel. PD17- scrolls left and right. PD17 - scrolls left and right only on the timeline with the scroll bar only if the line with the scroll bar is first clicked on mine. Quote PD17 - scrolls left and right only on the timeline with the scroll bar only if the line with the scroll bar is first clicked on mine. Mine scrolls horizontally without clicking first as long as the cursor is hovering over the timeline and there's already content there (meaning whenever a horizontal scroll bar is present). It also scrolls vertically when hovering over a library/room as long as a vertical scroll bar is present, even without clicking. It would be nice to hear from anyone who has a horizontal scroll wheel to see what (if anything) happens in PD17 when that's used. 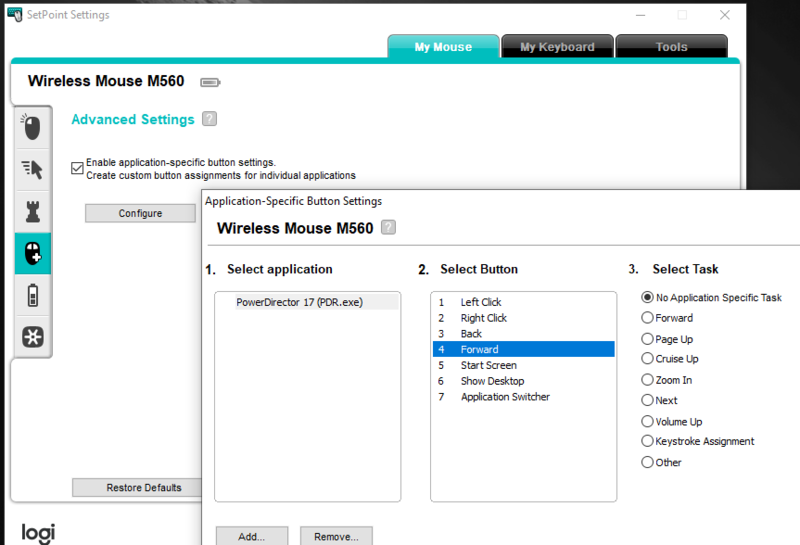 I haven't tried that software, but I have tried Logitech's 'Options' software, which they recommend for this mouse. Unfortunately it dosn't do anything to set it specifically to PD14. It seems I may have to take the plunge and upgrade to find out. I do like the software though so it'll probably be worth it either way. So I'll check back in a bit when I've messed with it. Nope no good, the horizontal scroll wheel doesn't scroll the timeline in PD17, it just does nothing for some reason. I guess I can just hope that they implement that functionality one day. Quote Nope no good, the horizontal scroll wheel doesn't scroll the timeline in PD17, it just does nothing for some reason. Two of us can scroll horizontally so it’s perhaps mouse-specific. Right, it's the vertical wheel that scrolls the timeline in PD17. I'm pretty sure that apps have to be built with the internal code to utilize a second mouse wheel, and since they're kind of a niche item, it may be hard to find many programs that support them.